What were the biggest challenges, the busiest moments, the last minute fixes? Methods used to keep track of stuff?… Did most stuff run much longer than expected? Most interesting modules to prep? Unexpected setbacks? 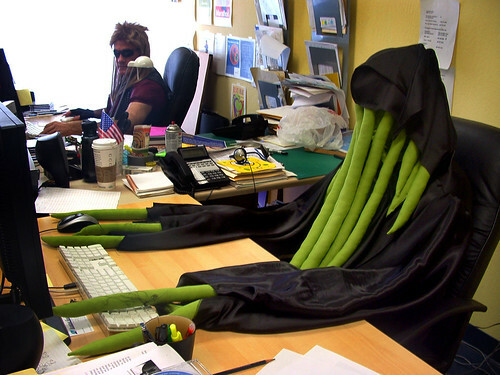 First, a definition: “monster desk” is what some larps call the person(s) responsible for keeping monster camp (i.e. the staff/cast headquarters) running. What exactly this involves varies from game to game, but I think it’s legit to say it involves tactical response to needs that arise in the game. They aren’t writing plot, and for the most part, they aren’t going on mods, but they are doing a lot of behind-the-scenes work to make sure the game keeps running — preferably on time. In Cottington those urgent needs are often like “I need stats for a giant plant,” “can you print these tags?” or “can I look at the writeup for this mod?” In other games, monster desk might handle costuming, makeup, or NPC food. I’ve also been in games that didn’t have monster desks — arguably it’s a role you don’t need someone to do permanently if the individual staff can do these things on a self-service basis. Shadows of Amun, for example, doesn’t have a monster desk, but there’s a printer if, say, you’ve realized you forgot to print something you need; and there’s usually at least one staff member in monster camp at all times. But anyway. My first big responsibility for monster desk was something I took on myself. Cottington almost never has writeups (or tags, or stat cards) for mods printed out beforehand, which can cause significant delays when it comes time to run those mods. On hearing I was slotted to work the desk, I decided to at least handle the printing for Friday’s mods. In particular, I wanted to get a headstart on the printing needs for the mod called “Alice Rescues the Cat,” which was a giant, all-town mod which would take up the entire early evening. Among the moving parts were pages of letters which the NPCs were going to give out as loot, seventeen trivia questions with a complex “lift a flap to reveal a letter” mechanic, tags for each of eight vision circles, tags for a few different gates, and tags for another seventeen or eighteen nodes of insight. Printing this was a massive undertaking, and I’m SO GLAD I decided to do it beforehand — I can’t imagine printing all those tags at game. Assembling the tags then took even more work. I ended up arriving on site at around 6:30pm — late for me — and spending until 9pm assembling everything — cutting out the hundreds of letters, filing the mod writeups I’d printed out, and putting together the question tags. (Thanks to Gaylord and new larper Kristina, who helped with these). The truck with all the Monster Camp gear (including printers, scissors, tape, etc) arrived on the early side, which was helpful, as I desperately needed tape for assembling the question tags. By the time I was done assembling, it was time to set up — well past it, in fact. It’s all kind of a blur in here, but basically my work at this junction involved getting the NPCs stats (a printing need I had neglected, requiring the printer to get set up before I could do anything), making sure all the equipment we needed went up to the mod space at the hangar (nightmare costumes, fairy costumes, rope lights, fog machine, speakers and iPods, etc), getting myself into costume (because I had not one, but two roles to play in this mod! ), running up to the hangar (already late), and trying to follow Michelle (the plot writer’s) instructions to set the mod up. Setup for this mod was the worst part of the evening. I was dehydrated, being eaten alive by mosquitos, and trying to figure out obscure instructions by flashlight. A word on obscure instructions: When I had printed the tags, I remember having a moment of “oh, I have no idea how these are supposed to work… oh well, Michelle can tell me that.” In fact Michelle could not tell me, as she was busy playing her NPC Gwyndalyne and entertaining the PCs until we could get this mod rolling. This is often the case at this game — Michelle cannot bi-locate, and as the game owner often needs to be sixteen different places at once — and so I don’t know why I had the illusion that she would be there for setup. But that was the expectation I had, and nothing seems to trouble me more than rumpled expectations. Did I mention it was raining? And that half of the battery-powered rope lights were not working? And that while I had a few able assistants (Alex P, Scott M, and Gaylord deserve massive kudos for the work they did), the majority of the NPCs were standing around in the hangar shooting the breeze? (To be fair, it’s what I’d be doing if I weren’t given a job, too. And I was far too busy to give more than a couple people jobs). And the clock was ticking. We were already… an hour late? I was overwhelmed with a sense of “everything is going wrong and it’s all my fault.” In the past I’ve gotten through stressful times at Cottington by telling myself “not my circus, not my monkeys” — but now it was my circus*, and the monkeys weren’t dancing in time. * It may not in fact have been my circus, but it felt like it more than it ever had. As a result, I ended up acting embarrassingly childish. I threw the battery lights. I reamed out John (Michelle’s husband, plot writer, and game co-owner) when he came up to brief the NPCs. Scott later described me as “flipping tables”. During my lapse in sanity, however, Alex and the other helpful NPCs acted like adults and made the judgement calls I seemed mentally incapable of making. So that was most of my Friday night. It answers “biggest challenge,” “busiest moments,” and “last minute fixes” questions in one fell swoop! It got better from there. To be fair, I don’t think I would have been doing so much setup if it weren’t for the fact that I was in the mod. Plus, the rest of the weekend I had the ever-competent Holly, fellow logistics person, to hold my hand and assure me that the monkeys were, in fact, going to be all right. Making sure there were printouts for the “hive mother” Aranea who were going to be doing a series of terrible calls to the invasive-infected PCs. Giving instructions to the half of the NPCs who weren’t going to be in the first mod to set up Alumni Field. This may have led to two NPCs holding up glow-in-the-dark spider webs to the light in Monster Camp for a half hour. (Their idea, not mine. I’m not a cruel taskmistress). Made sure all the Aranea costumes got carted up to Alumni Field along with the spider webbing. Notice how none of this involves setting up glow-in-the-dark spiderwebs in the dark myself? That’s how it’s supposed to work. It does, sadly, mean I never got to see how it looked, but I’ll live with that. Methods used to keep track of stuff? Like most games I’ve NPCed, Cottington has a color-coded schedule on the wall that lists mod names, NPCs, and mod spaces. We typically schedule in 1.5 hour blocks (an improvement from the one-hour blocks we had when I started NPCing); the Friday night mod was scheduled for 3 hours, and it still ran over. On top of that, we have a Google Drive folder with all the writeups (such as they are — some are more sketchy than others), and the staff site, which has a “Book of Beasts” that lists stats for common monsters. (Pro-tip: not nearly as much is in the Book of Beasts as you would hope). The usual workflow of an NPC is read the schedule –> read the writeup (if it’s printed; otherwise get a logistics person to print it out first) –> grab a costume (with help from our talented costume/makeup maven, Sarah N, if needed) –> grab stats –> go help with setup. Stats may just be rambled at you (“you have 8 Vitality, take a Maim or an Agony every other life,” etc) or you may get a slip of paper with stats. I tried to make sure there were stat printouts for the bigger combat mods ahead of time, but I didn’t always succeed. I also tried to keep a donations sheet (which we never seem to do, and I worry that PCs don’t get their donation CP) and an NPC sign-in sheet. Did most stuff run much longer than expected? Hmm… we’re always off-schedule, but I’m not sure it’s that stuff runs long so much as there’s slippage due to various factors. Factor number one is not giving ourselves enough time for prep — the Friday night Alice mod, for example, probably should have had an hour of prep written into it, in addition to the three-hour run time. Factor number two is, I think, an issue of NPC empowerment. It’s not always clear who the mod runner is — who’s responsible for pulling the NPCs together, gathering props, setting up the space, and hooking the mod. Sometimes it’s the author, but 80% of the mods are written by Michelle, and she generally isn’t available to do this stuff. And when it’s something anyone can do, no one does it. In general if I’m written up to be the hook, I consider myself to be the mod runner. If someone tells me I’m the mod runner, I’m the mod runner. When in doubt, I read the writeup, put on a costume, and look helpful. Unfortunately, not everyone does the same thing. Sunday was arguably our most on-track day, and I think it’s because at the beginning of the day I said, “Okay, NPCs, check the schedule and see what mod you’re in at 10am. Consider yourself empowered to run it, if necessary.” Stuff still went askew (a lot of stuff had to get canceled because the prerequisite mod from Friday or Saturday hadn’t run) but a greater percentage of mods ran than on any other day. Factor number three in time slippage is definitely just the sheer number of mods that are supposed to run at any given time. It varies between five and ten mods in any given spot! I think part of this is an artifact of the campaign ending soon — we only have three more games to fit everything in. We typically deal with slippage with a Saturday night huddle — this game was no different. Here, we (meaning Holly and myself) sat down with Michelle and John and prioritized what mods must run and what can be deferred until tomorrow or until next game. Sometimes it’s three mods that must run before dinner, and we have no idea how we’ll get through that, but we somehow manage. If you saw Robin and his letter from Silk, that was a mod that had to happen which we pulled off against all odds. Most interesting modules to prep? I think prepping the back-to-back Invasive Fight/Mothlands mod was the most interesting — it also went arguably the smoothest. There was interesting costuming, interesting mechanics, and interesting set dressing to arrange. And, for the most part, we pulled it off! I guess that’s all I have to say about working monster desk. It is hard work, but it is tremendously rewarding when a mod goes off on time and the PCs enjoy it.